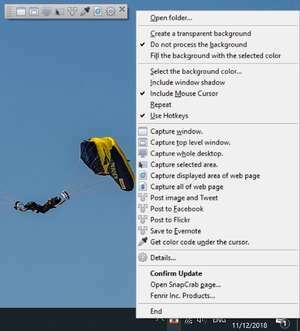 SnapCrab for Windows is a screen capture software that can take images of anywhere on your desktop and then save them in PNG, JPEG or even GIF format. You can freely capture the full-screen, and specified windows and areas. Furthermore, you can also capture web pages from your browser by linking through Sleipnir. Capturing is simply controlled by just clicking the icon in the tool bar. Version 1.1.2 is a freeware program which does not have restrictions and it's free so it doesn't cost anything. For security reasons, you should also check out the SnapCrab download at LO4D.com which includes virus and malware tests. Additional screenshots of this application download may be available, too.